Before we get to the work list, let me tell you about what's blooming in my garden right now. 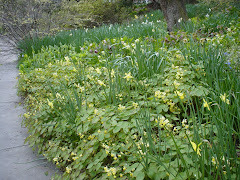 In the new woodland garden, the hellebores is blooming nicely. Two weeks ago the Hepatica was blooming. Also, the Mertensia (Virginia bluebells) is up and growing and is getting ready to bloom. In the sunny perennial garden out front, the daffodils have almost all gone by, as have the tulips. The season for my bulbs is just way too short. But, on the bright side, the Mertensia is in full bloom and the Pelomonium (Jacob's ladder) is just setting its lovely blue/purple flowers. Time to plant dahlia, gladiolus, tuberous begonia and other tender summer bulbs. By next week if the warm weather continues, you can plant annual seeds and put out annual plants such as marigolds and wax begonia. Naturally, you can plant perennials. Grass seeds won't germinate well until lthe weather wamrs the soil. Between Mother's Day and Flag Day, I am going to plant grass seed. This weekend, I am going to spread lime and organic fertilizer. I am seriously looking to get rid of my moles so I will look to spread an organic mole solution such as Mole Med. The snow peas and the English peas are already planted and so is the arugula, mache and mesclun mix. I am waiting for all of them to germinate. Between Mother's Day and Memorial Day I will plant tomatoes, peppers, eggplant, rosemary and leeks. I usually wait until early June to set out basil, it just doesn't seem to like cold weather at all. By the way, my chives are up and I am eating them on everything! Great show! It makes it feel like spring.